Cross-platform play is something PUBG Corp 'really wants' to do. PlayerUnknown's Battlegrounds (PUBG) has been this year's biggest surprise. Since launching on Steam Early Access in late March, the game, which conceptually started life as a DayZ mod, has picked up 25 million players on PC, not to mention a marketing and publishing deal from Microsoft for an Xbox One version. This week, version 1.0 arrives on Steam, gaining a second map and new instant replay feature in the process. But for PUBG Corp CEO Chang Han Kim, even though the game is losing its beta status, work is far from finished. "When we first started this project and thought of the Early Access model, we never took it as a model where you start developing a game, you complete it, you ship it out and then be done with it," Kim said through a translator. "As long as we have fans out there playing our game, it will never be complete." Prior to PUBG Kim worked on multiplayer games in South Korea where each project spent around five years in development. He said the hardest part was getting meaningful feedback from players during limited alpha or beta tests and then being able to implement it in the game before it was too late to make sweeping changes. 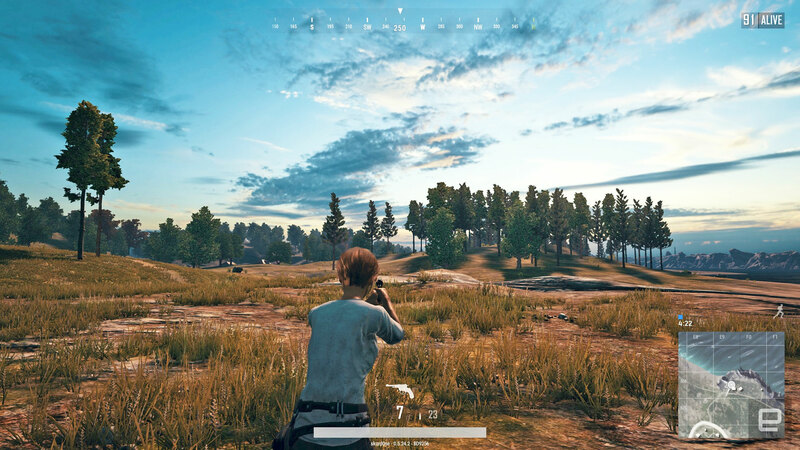 For PUBG he wanted to try a different approach: get a working prototype out as fast as possible and from there, keep tacking on features, all while keeping an ear to the ground. "We took an indie-development approach," he commented. "As long as we have fans out there playing our game, it will never be complete." Kim said this alone has given the team a chance to focus on making the core gameplay the best it can be. The benefits are obvious. While the main menu is sluggish and the pregame lobby chugs along, once your brief cargo plane ride is over and you're on the ground, almost everything smooths out. That's when the addictive hunt for weapons and people to shoot them with begins. That's not to mention the quest for the ever-illusive "chicken dinner" for being the last of 100 players standing. When I spoke with PUBG Corp's Brendan "PlayerUnknown" Greene in October, he said that there wasn't a release date for a PlayStation 4 version of the game because the team was focused on getting the Xbox port out the door as well as getting the Xbox version up to par with PC as fast as possible instead of adding another console into the mix. The result of that diligence could be cross-platform play between PC and Xbox One players. "It's important that we get the two build versions to be identical to make it happen," Kim said. "Cross-network play between the PC and Xbox is something the entire team really wants," he added, but there are a lot of issues to resolve before that can happen. For starters, PUBG Corp needs to figure out how to fairly match PC players using a keyboard and a mouse against people using a gamepad on Xbox One. Microsoft has linked Forza Horizon and Gears of War 4 players, so it seems likely that once the two versions reach parity, PUBG will eventually get the same treatment. But don't expect that anytime soon. "We've only just launched on the Xbox Game Preview Program, and right now, the bigger focus has to be trying to further stabilize and optimize the [game]." In the months PUBG was in Early Access, being developed in public as it were, it picked up a high-profile competitor, Fortnite: Battle Royale from Epic Games. Epic's Unreal Engine is the toolset that powers both PUBG and Fortnite, and the studio admitted it was inspired by Kim and Greene's game in marketing materials for its free battle royale add-on mode. "At Epic, we're huge fans of the battle royale genre and games like PUBG and H1Z1," worldwide creative director Donald Mustard said in a trailer (below), hyping his own spin on the genre. "We thought Fortnite was the perfect world to build one in." PUBG Corp responded in several ways. In a press release, Kim said that PUBG Corp was never asked permission to use his team's game as part of the promo tactic. Kim also said he was worried that "Fortnite may be replicating the experience for which PUBG is known." The way he closed the press release is especially telling: "The PUBG community has and continues to provide evidence of the many similarities as we contemplate further action." This week, Kim was far more reserved, saying that the experience wouldn't affect him using Early Access for future projects. "Early Access and the competition are two different things that are not necessarily linked with one another," he said. "We feel like PUBG is a title that really embarked on a new battle royale" and that because of PUBG Corp's success, it was only natural to expect other games in the genre, including the Fortnite mode. When I pressed Kim for follow-ups based on his comments in September's press release, a PUBG Corp spokesperson interrupted me to say that our interview was only going to cover the PC version's 1.0 milestone. PUBG's story, in many ways, mirrors Minecraft's. Despite its 1.0 status, the game is still a work in progress. But the underlying ideas are enticing enough that one can overlook the kludgy graphics and occasional bug. Version 1.0 is a major milestone, but in many ways it's anticlimactic: This is just another iterative update, fixing glitches and rebalancing combat. It was inevitable that copycat titles would crop up along the way (it happened with Minecraft too). For PUBG, the challenge remains the same, regardless: keeping the community happy and adding more features without losing what made the game special in the first place.